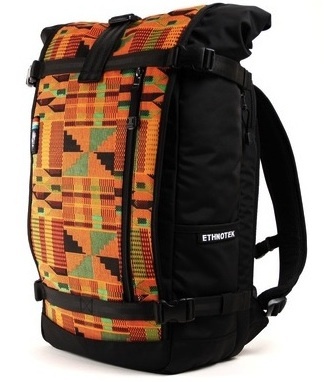 Matador is giving away three backpacks courtesy of Ethnotek. A few weeks back we announced that Matador community member Jake Orak’s awesome new company had launched. Ethnotek creates backpacks with beautiful, removable front pieces, called THREADS, that are handwoven and dyed by indigenous tribes – and we’re giving three of them away. It takes more than a few weeks to really test out a backpack, but I’ve done what I can. What has my Ethnotek bag been through so far? I’ve made use of as many of the bag’s features as possible. The zipper pocket on the right side – perfect spot to stash my iPhone. The slip pocket on the right is great for headphones, and the mesh pocket on the left is actually deep enough to hold my weirdly long BPA-free water bottle. Yoga mat strapped to the bag with compression snap-buckle straps – check. 15” Macbook in the laptop compartment – check. All manner of clothes, shoes, dog dishes, towels, balls and bones, journals and pens, fruit and kibble stuffed in the main compartment – check. I mentioned the front panel, the THREAD, is removable, which means it’s also replaceable. Ethnotek doesn’t request certain fabrics and designs from these workers, they just show up and see what looks cool, meaning all bags are limited editions. If a new THREAD pops up that catches your eye, maybe something from Indonesia or India, you don’t need to buy a new bag – THREADS are sold separately, ranging from $29 to $99. I don’t throw the word “unique” around often, but I’ll do it here – Ethnotek is a unique company with a unique product, well worth checking out.